Posted on November 23, 2016 at 9:19 am. Let’s discuss saving money this winter so you can have more cash in your pocket to spoil your loved ones with come Christmas! If you are fortunate enough to live in a house with lots of natural sunlight, utilize it to warm your house so you don’t have to run your heater as much. Pull back your curtains during peak hours in the day and let it shine in! If you notice your windows don’t seem to be well insulated and are letting in cool air, consider applying clear tape inside the frames to keep the heat in and the cold out. You can also use caulk to seal possible air leaks located around doors. Turn down your thermostat and bundle up at night in bed with thick quilts, or keep cozy warm blankets on the couch to snuggle with while you relax in the evenings. 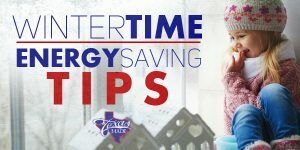 Adjusting your thermostat by just a few degrees can make a huge difference on your power bill. If you have a thermostat that can be adjusted via your smart phone, take advantage of this feature to make sure your house is being heated while it is empty during the day. Change the settings an hour or two before you return home to make sure the house is comfortable upon your arrival. Consider buying small space heaters to create heat in individual areas throughout your home, (but never leave them unattended). They may provide sufficient heat so you don’t have to run your HVAC system continuously. This can help save energy. If you have a fireplace, think about using glass doors and incorporating a heat/air system that has the capability to push air that has been warmed back around your house. Save energy costs by using LED Christmas lights if you are going to decorate. They use less energy but are just as beautiful.